The Photodigm family of high-power edge-emitting Distributed Bragg Reflector (DBR) laser diodes are based on Photodigm’s proprietary single epi growth, DBR laser architecture. The Photodigm DBR laser architecture consists of a gain region and a separate DBR grating region, monolithically fabricated over a continuous ridge waveguide, as shown in Figure 1. With this design, Photodigm has produced the world’s highest power commercially available, single-frequency, monolithic laser diodes for instrumentation, metrology, and spectroscopy in the wavelength region 740 to 1083 nm. Over the years, Photodigm DBR lasers have proven themselves to be ideally suited for applications requiring high-power single-frequency performance within a well-defined operating range. Photodigm has worked with its customers to develop a family of products unmatched in the industry, optimized for stability, reliability, and power for precision applications in spectroscopy, atomic physics, non-linear optics, and fiber amplifiers. Figure 1. Fabrication steps of the monolithic DBR laser, as produced by Photodigm. DBR lasers were among the first single frequency lasers, with development beginning in the 1970‘s. They were commercially produced by SDL in the 1990‘s for research applications requiring resonance with atomic transitions at 780, 852, and 1083 nm. The telecom boom in the late 1990’s to early 2000’s forced laser manufacturers to focus their capacity to meet the explosive demand in telecom applications. The needs of low power signal lasers for wavelength division multiplexing were best met by distributed feedback lasers, and DBR lasers for instrumentation and metrology disappeared from the market by the early 2000’s. Furthermore the 1300 and 1550 nm lasers required for telecom were produced from InP, which has a favorable processing chemistry for DFB fabrication. Several manufacturers stepped in to fill the SDL void by 2002, using the DFB architecture so successful in telecom. Characteristic of DFB lasers, these devices had relatively low power. Characteristic of AlGaAs lasers, they had a difficult processing chemistry, and they experienced poor reliability when operated at the higher power required in instrumentation. Photodigm introduced its product line based on its single epi growth DBR architecture in 2007, directly competing with DFB lasers in the 780 to 1083 nm band. The goal of this new product was to offer a product that could operate at higher power and with better reliability than the DFB, while at the same time offering a production pathway that offered improved manufacturing scalability though single growth epi. Photodigm’s DBR lasers offered a distinct technology choice for users of instrumentation lasers in the near IR band. Users soon came to value the higher performance and better reliability of the DBR laser over the DFB laser, with the result that Photodigm DBR lasers are now recognized as the standard of performance for applications such as atom trapping, metrology, and instrumentation, which require high power, narrow linewidth, high reliability, and the ability to lock and remain locked to a specific frequency. The Photodigm DBR laser starts on a GaAs wafer with multiple epitaxial layers grown in a single growth. Photodigm engineers design the epi using proprietary software and backed by many years of laser design experience. The epi consist of one or more high refractive index quantum wells surrounded by low index cladding layers that will form a waveguide. Following the precision growth of the epi, the laser structure is fabricated with surface features that define a monolithic, single mode index-guided ridge waveguide that runs the entire length of the device. The laser resonator consists of an electrically pumped gain ridge region and a passive DBR ridge region. The gain ridge is designed and etched to a precise depth to operate in a single spatial lasing mode by current injection into the quantum well. 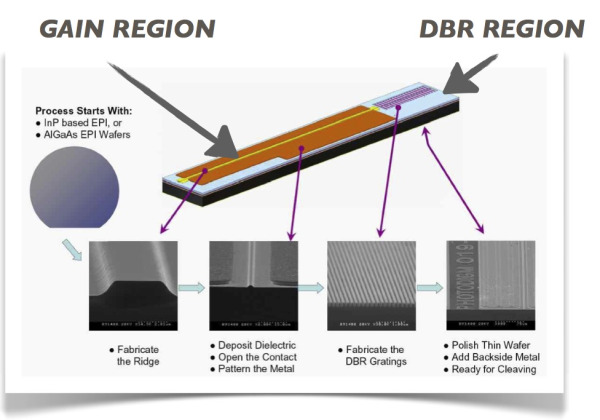 The separate DBR region is a wavelength selective Bragg mirror that provides feedback within a narrow spectral bandwidth. By overlapping the reflectivity of the DBR with the gain bandwidth of the epi, the DBR mirror will select the single longitudinal mode with the highest gain, producing a highly stable beam at a precise wavelength. The resonant cavity is defined by the highly reflective DBR mirror on one end, and a cleaved exit facet passivated and anti-reflectivity (AR) coated on the other end. The AR coated exit facet serves as the outcoupler for the diffraction-limited beam. Figure 2. Cross sectional diagram of DBR laser showing main features of the device. A characteristic of this design is the surface grating, which is etched into the semiconductor cladding layer above the quantum wells in the passive region of the ridge waveguide. However, the waveguide mode is strongly coupled to the DBR. The mode is periodically reflected at the resonant wavelength of the grating. Longitudinal modes not resonant with the DBR do not experience feedback and are lost. A DBR mirror consists of alternating layers of high and low index materials. In an etched DBR, the grating teeth are the high index material, and the low index grating spaces are filled with low index dielectric. The Photodigm DBR may have as many as 2000 grating teeth over a 500 micron long DBR mirror. The high index contrast of the grating structure results in a resonant reflectivity of the Bragg mirror that can exceed 90%. A competing architecture exists to produce a single frequency laser diode, known as the distributed feedback, or DFB, laser. DFB lasers and DBR lasers share many of the same characteristics of narrow linewidth and tunability. Whereas DBRs have a Bragg reflector separated from the gain region, DFB lasers have a feedback structure consisting of a low-contrast, weakly reflecting Bragg reflector distributed along the entire length of the gain ridge, hence the name distributed feedback laser. Whereas the DBR is fabricated on single growth epi, the DFB requires that the grating be buried under a high index layer, epitaxially regrown over the grating, in order to form the waveguide. See Figure 3. This fabrication difference leads to critical distinctions between the operational characteristics of these two architectures. The DFB epi begins as a high index quantum well structure between two low index cladding layers. The gain ridge is fabricated all along the length of the laser structure by etching the upper cladding. The grating region is similarly fabricated along the entire length of the gain region. In order to confine the mode and produce the desired feedback response of the grating, a lower index cladding layer must be epitaxially regrown over etched cladding layer. Also regrown is a highly doped cap layer for current injection. The characteristic of the DFB is the buried grating. Because the DFB laser is designed to experience feedback all along the gain ridge, no end mirrors are needed. However, in the perfectly symmetric case, opposing reflections at the Bragg wavelength are anti-resonant, or destructive, and lasing does not occur at the Bragg wavelength. However two modes equally spaced and around the Bragg wavelength are produced, the difference between the two modes being known as the stop band. To achieve single longitudinal mode performance, the laser is fabricated to destroy symmetry. This is typically done by having an anti-reflective coating on one end, which favors one mode over the other, and the laser operates on the favored mode. The distinguishing difference between the two architectures is the location of the grating within the epitaxial structure. The DBR uses a high index contrast, high reflectivity surface grating. The DFB uses a low index contrast, low reflectivity buried grating. Both architectures begin with carefully designed epitaxial wafers. Both rely on sophisticated semiconductor fabrication techniques of etching, lithography, and chemical vapor deposition. However, following the precise fabrication of the ridge waveguide and grating structure, the DFB must undergo a further epitaxial regrowth step to produce the low index contrast distributed feedback grating prior to metallization. By contrast,the DBR is finished with a simple CVD dielectric to encapsulate the device and prepare it for metallization. Regrowth in the GaAs/AlGaAs materials system used for laser diodes between 740 nm and 1083 nm is a difficult process. Al and GaAs are reactive with oxygen. In DFB fabrication, the epi surface is exposed to atmospheric oxidation and contamination during ridge and grating processing between the first and second growth steps. The effect on device performance was studied in detail on broad area lasers by researchers at the Paul Drude Institute and reported in a 2001 paper (1). They found an increase in the internal losses by a factor of approximately 2 in both GaAs (822 nm) and InGaAs (986 nm) quantum well devices as a result of the regrowth. The gain coefficient of the AlGaAs lasers also dropped by a factor of 2, while it increased for the InGaAs lasers. The increase in the gain coefficient in the 986 nm devices was attributed to a subsequent annealing step, which had no effect on the 822 nm devices. 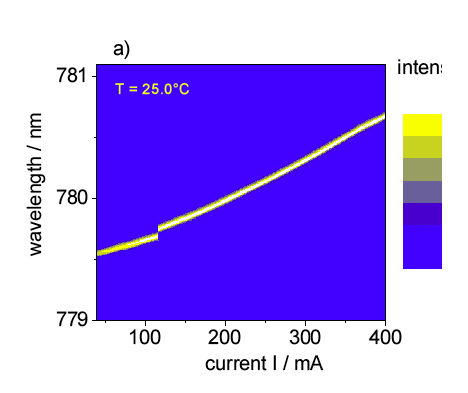 These researchers concluded that the lower performance in the regrown devices was due to the fact that residual contamination of the regrown interface forms defect states what act as non-radiative recombination centers. Lower defect levels in the regrowth-free DBR laser results in higher powers and improved reliability when compared to DFB lasers. Photodigm DBR lasers typically have lower threshold currents, higher slope efficiencies, and rated power levels two to three times higher than competing DFBs at the same wavelength. Multiple users have reported narrower linewidths for DBR lasers as compared to DFB lasers. While studies have not been performed to determine why this is the case, Photodigm believes that this is due to defects in the epi that arise from regrowth. Cavity length, operating power, and fabrication details may also result in higher noise in DFBs over DBRs. The regrowth problem has led to significant efforts to fabricate DFB lasers that do not require regrowth. DFB lasers using lateral gratings over the ridge waveguide have been proposed (2) and are commercially available, but to date, they have only been shown to deliver low power levels (<25 mW), and thus are not competitive with DBR lasers in the near IR band. Another major difference between the two architectures relates to mode selection. As fabricated, the DBR laser operates only at the single longitudinal mode that has the highest gain within the overlap of the reflectivity curve of the Bragg reflector and the gain bandwidth of the epi. As current is passed through the gain ridge, the gain ridge will experience heating with a consequent red shift of the gain bandwidth. The DBR region, being passive, remains with fixed spectral reflectivity. As the laser is tuned by varying current or temperature, the wavelength of the lasing mode will monotonically change as the gain curve of the epi shifts. However, the spectral reflectivity of the DBR grating does not change, since no current flows through it. As the lasing mode shifts, it moves to a lower reflectivity part of the DBR. Eventually, another mode becomes favored by the DBR mirror, and this new mode will grab the gain. The laser will hop to the new mode and retrace the tuning curve. Away from the discontinuity of the mode hop, the wavelength tuning is deterministic and predictive. As fabricated, the DFB laser operates with two modes, each equally spaced from the Bragg wavelength of the grating. This is not useful. To achieve single mode operation, symmetry must be destroyed, usually by an AR coating on one facet. The spectral gap around the missing mode is known as the “stop band,” where the laser will not operate. Because the grating and the gain region both experience heating due to increasing current injection, both will tune monotonically without a mode hop for a long range. Eventually, however the gain is reduced sufficiently that the laser becomes unstable, and a new mode appears. The initial laser conditions, consisting of a finely tuned combination of antisymmetry, facet reflectivity, epi gain bandwidth and grating bandwidth are no present. The laser will mode hop across the stop band, resulting in a spectral exclusion zone. Users of DFB and DBR lasers will experience significantly different behaviors during laser operation. With increasing current, a DBR will tune monotonically with approximately a 0.002 nm/mA characteristic slope. On reaching a mode hop, the DBR laser will predictably blue shift and retrace the the normally occurring red shift. Typically mode hops occur with a free spectral bandwidth of to 0.15 nm, depending of the specific device. See Figure 4 for a typical tuning curve of a DBR, showing the deterministic mode hop behavior. The DFB will tune monotonically with a similar characteristic slope. However, due to the concurrent shift of the epi and the grating reflectivity, the free spectral range of the DFB will be much higher than the DBR. This can be 2-3 nm for the DFB as it red shifts across its operating range. The mode hop free tunability in a DFB is generally higher than in a DBR, and this is often cited as a clear advantage of the DFB over the DBR. However, when it occurs it is not deterministic, and it does so in such a manner that it leaves a gap in the tuning range. As a result of this behavior, DFB lasers as produced are often heavily “binned” as to mode hope behavior, and the end user is offered multiple “variants.” These variants are selected for specific mode hop behavior. Figure 4. Typical tuning curve of a Photodigm DBR laser. With increasing current, the wavelength of the laser red shifts as the device heats up. Eventually a blue shift occurs to a higher gain mode. As a result the tuning is deterministic, and a specific wavelength can also be achieved. This non-deterministic mode hop behavior relates to what Photodigm calls the “fatal mode hop” often encountered with seemingly well-behaved DFB lasers used in applications requiring locking to a specific wavelength, as in rubidium resonance. 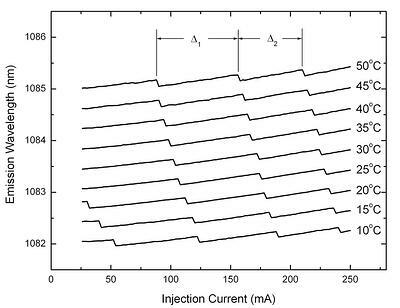 High current densities in laser diodes, exceeding several thousand amps/cm2, cause aging of the gain medium. As the gain medium ages, the current increases, which leads to a red shift of the gain curve. Because the grating in a DBR laser is fabricated in the passive region of the ridge waveguide, the reflectivity spectrum of the DBR remains fixed. When the gain bandwidth of the epi red-shifts sufficiently so that the lasing mode is no longer the highest gain mode, a new, shorter wavelength mode will grab gain and become the lasing mode. The laser experiences a blue shift mode hop that will retrace the wavelength of the previous mode, providing continuous tunability within a well defined range. The actual range will depend on multiple design and fabrication characteristics. Figure 5. Typical tuning curve of a DFB laser (3). With increasing current, the wavelength of the laser red shifts as the device heats up. Eventually a red shift occurs to a higher gain mode, leaving a gap in the tuning range. This is a fatal mode hop if the desired wavelength exists within the gap. Chart from reference 3. DFB and DBR laser are the two most common forms of high power single frequency semiconductor lasers in use for scientific instruments today. They both offer high efficiency and remarkable spectral purity, thus enabling many metrologic instruments. Despite their many similarities, the two architectures exhibit distinct behaviors that impact how they will perform in specific applications. Photodigm DBR lasers have been shown in multiple applications to provide high power, high reliability, low noise, low linewidth, and stable operating characteristics for long lifetimes. The single growth epi and separate passive DBR region, which distinguish Photodigm DBR lasers from competitive DFB lasers, are the primary reasons for their success. (1) M. Wassermeier, R. Hey, M. Horicke, and E. Wiebicke, Semicond. Sci. Technol. 16:L40-L43. (2) R. Tiberio, P.F. Chapman, Electronics Letters 30:1058-1060 (1994).